Traditionally, the FUN show held in Florida during the first few weeks of the new year is the location of the year’s first major auctions, and 2017 is no different. In conjunction with the show, Heritage Auctions will offer several thousand lots of U.S. and world coins and currency in both floor and online auction sessions. While there are too many highlights to cover all of them in a single article, we’ll still attempt to showcase some of the rarest and most exciting offerings that will come to the auction block in Fort Lauderdale, where the show is held this year. All lots discussed in this article, as well as all other lots offered, can be viewed in full detail on the Heritage website. The highlights of any Heritage Auction session are usually sold in a special floor auction called “Platinum Night,” which for U.S. coinage will be held on January 5. The first lot we will take a look at is very appropriately listed in the catalog as “The Finest Morgan Dollar Money Can Buy.” Lot 5744 is an 1880-S silver dollar, graded MS-69 Prooflike by PCGS. While considered one of the most common dates in the series in high grade it is a true rarity at this grade level, and in fact it is the single finest known for the entire series. While there have been eight other grading instances of a Morgan dollar at the MS-69 level (most of them dated 1880-S as well) this coin is the only prooflike example graded as such by PCGS or NGC. Pedigreed to the Bermuda collection, the coin last crossed the auction block in the fall of 2011, when it realized $86,250. 1880-S silver dollar, MS-69 PL (lot 5744). Gold ingots of the California Gold Rush are very esoteric (and expensive) items about which relatively little is known. However, the recovery of the wreck of the S.S. Central America has much expanded our knowledge of these ingots and the companies that made them, as hundreds of different examples have been brought to the surface in recent years. Platinum Night at FUN offers a select few of these historic ingots, including lot 6146 (shown at the top of the page), a 327.97-ounce ingot made by Justh & Hunter, a company founded in California in the mid-1850s. The ingot, which is the second-largest known of this company, was part of 86 ingots brought to the surface after the ship (and its contents) was discovered in 1988 off the coast of the Carolinas. The ingot was no doubt headed to the Philadelphia Mint to be melted and turned into coin, but the ship’s unlucky encounter with a hurricane in the fall of 1857 meant that it would be offered at auction over 150 years later for one lucky collector/investor to buy. Also on offer is a stellar selection of world coins, including a very advanced selection from the D. Moore collection, which contains a superb offering of coins from Russia. Russian numismatics has seen ups and downs in recent years but rarities remain much in demand. One such rarity offered for sale in Fort Lauderdale is , a gold pattern (or “novodel”) 5 roubles with the portrait of Elizabeth. Graded PF-64* Cameo by NGC, it is considered to be extremely rare, and is missing from most advanced Russian collections, including those of major museums. The collection features many other world-coin rarities in high grade, and is certainly worth a look even if you only have a modest interest in world coinage. Pattern 5 roubles, PF-64* Cameo (lot 33033). Offered in individual lots (34330 to 34341) is a virtually complete, high-grade Japanese Year 13 (1880) Proof set. Containing 11 coins plus three replacement coins in business-strike format as well as the box these coins have been kept in for over a century, this is a legendary numismatic item on par with the 1834/1804 Proof sets made by the United States Mint. While in theory as many as 77 complete Proof sets could have been assembled (several denominations have a higher published mintage in Proof) fewer than 10 Proofs are known of most denominations. Considered to have been struck as presentation pieces, this is no doubt one of very few nearly complete sets in existence, missing just three denominations (the Rin, the Sen, and the gold Yen) in Proof format. The entire collection, which has been kept together since the early 20th century, is expected to realize over $1 million, and we can only hope that one buyer is lucky enough to purchase all lots so that this extremely rare set is kept together for future generations to enjoy. Meiji Proof 2 Sen Year 13 (lot 34331, part of collection). 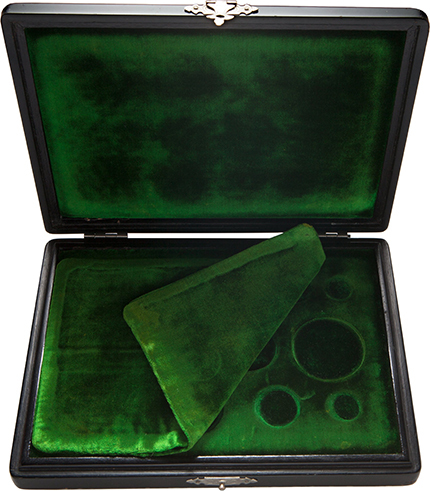 Century-old box housing the Year 13 (1880) Proof set (part of lot 34341). Moving on from coins to currency, Platinum Night for U.S. currency will be held on January 6. A total of 185 lots will be offered for sale, including classic rarities that very seldom appear at auction. Included in these are several $5,000 and $10,000 notes, always in demand with advanced collectors. Also worthy of attention is a pair of Large Size $1,000 Federal Reserve Notes from the 1918 series, one from the Boston district (lot 23110, PMG Very Fine 30) and the other from the San Francisco district (lot 23112, PMG Very Fine 25). Just 4 and 10 examples of each district, respectively, are confirmed, and the entire type as a whole is rare, thanks to the high face value of these notes and the fact that they only circulated for about a decade before being replaced by small size notes. Another Large Size rarity offered for sale during Platinum Night is lot 23080, an 1891 $100 Silver Certificate graded Very Fine 30 Apparent by PCGS. A very scarce type known by only a few dozen examples, mostly in well-circulated grades, the note displays a fine portrait of James Monroe on the front, which appears only on this particular (and short-lived) issue. $1,000 Large Size Federal Reserve Note, 1918 series, Boston, Very Fine 30 (lot 23110). $1,000 Large Size Federal Reserve Note, 1918 series, San Francisco, Very Fine 25 (lot 23110). $100 Large Size Silver Certificate, 1891, Very Fine 30 Apparent (lot 23080). The final lot we would like to take a look at is an extremely rare and high grade piece of Canadian currency. Lot 27144 is a 1935 $25 note with English text graded Gem Uncirculated 65 EPQ (Exceptional Paper Quality) by PMG. A very scarce and short-lived denomination, the note features portraits of King George V and Queen Mary on the front and Windsor Castle on the back. A very scarce and popular type in any grade, most survivors are well circulated, and uncirculated notes are extremely rare and highly sought-after. A combined 160,000 notes were issued with either English or French text (140,000 with English text and 20,000 with French text). Of these, just 1,840 were shown outstanding as of 2015, and the actual number of survivors is believed to be much lower. 1935 $25 note, English text, Gem Uncirculated 65 EPQ (lot 27144).